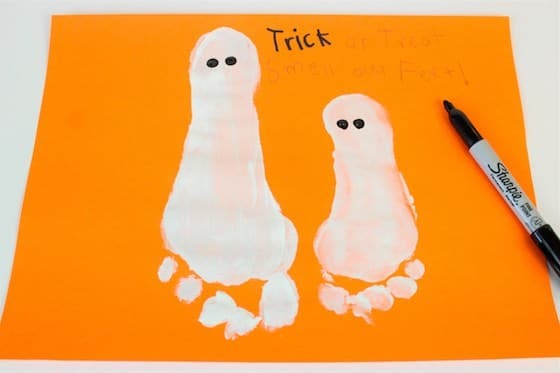 This Halloween Footprint Ghost is a fun and easy ghost craft for toddlers and preschoolers to do this October. Kids will love the process and you’ll have your child’s adorable footprint preserved for years to come. We’ve made several handprint and footprint Halloween crafts here in my daycare over the years. Our handprint spiders and skeleton footprints are two of our favourites. 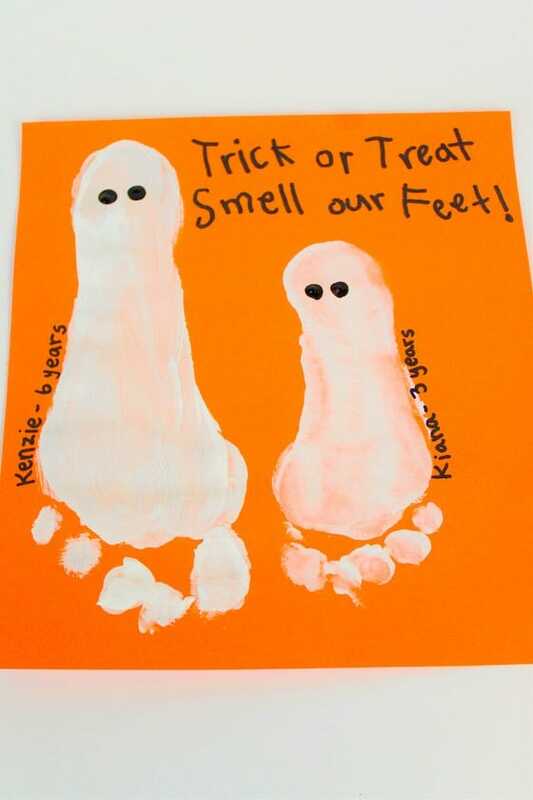 Today, we add another adorable footprint Halloween craft to our collection – footprint ghosts. Our footprint ghost is easy to make, and your kids will get a kick out of the process. My daycare toddlers and preschoolers have always enjoyed making footprint art. 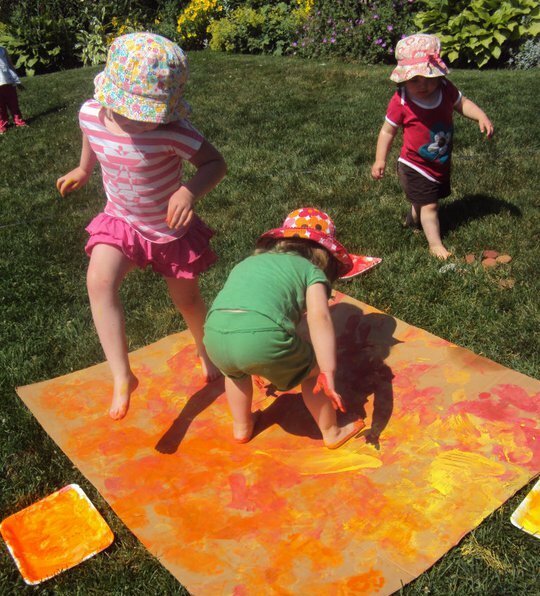 Whether it’s a big outdoor art activity or a specific footprint craft, they love having their feet painted and making prints with them. 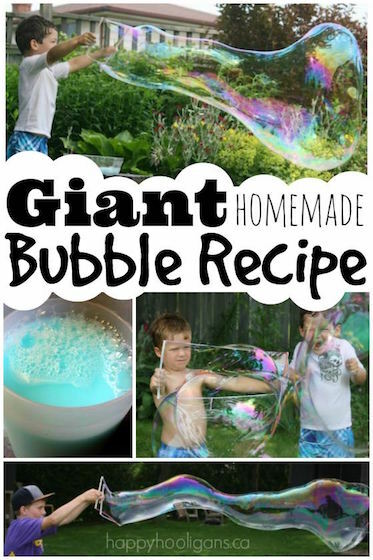 It’s so fun for kids to make art in unusual ways, using their bodies and getting messy rather than painting with paintbrushes and other traditional art tools. Footprint art is always loved by parents too. I have several footprint crafts that my boys made when they were little and I cherish them. It melts my heart when I look at them and see just how small their little feet were. 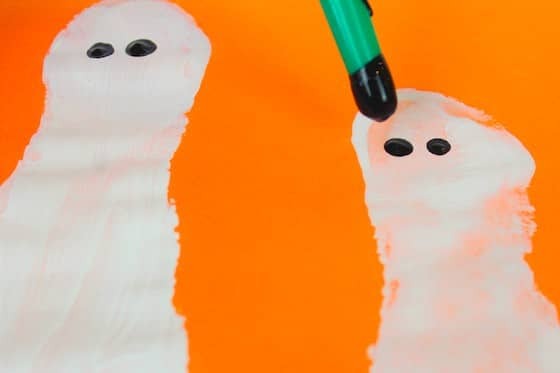 With todays easy project, your kids will be delighted to see their footprint transformed into an adorably spooky ghost. You can turn your footprint ghost into a greeting card like we did with our footprint Reindeers last Christmas, or make a bunch of ghosts and cut them out to make a garland. You could also frame and display your ghosts at home at Halloween, or simply display them on a bulletin board in the classroom. 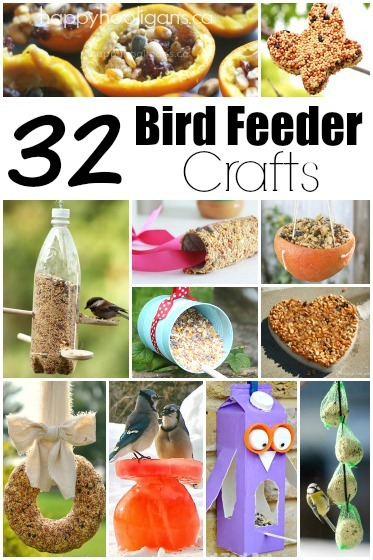 The days are getting shorter and the air is getting crisper and that can only mean one thing for my kids. Halloween. They’re on full countdown mode till their 2nd favorite holiday where they can Trick or Treat and get as much candy as possible. 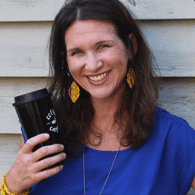 And my kids are begging me to get down the Halloween boxes out of the rafters so we can Halloween up our home, filling our tables with teal pumpkins for my food allergy kiddo, mummies, and a skeleton cat that dances to the Monster Mash. And while those decorations are some of my kids’ favorites, my favorites are the decorations that take a snapshot of our lives each year. Kid-made Halloween decorations like this Halloween sewing craft are always sweet and fun. But I love footprint and handprint art the most for one reason: our kids grow too darn fast. Every parent can agree with that one. So taking the time to create handprint or footprint art is a snapshot of this moment. It’s pausing time for a second and capturing the size of their little hand or their foot before they grow yet another size larger. And as a parent of kids who grow like weeds, I love looking back and seeing how my kids’ little hands used to fit into mine or how tiny their feet were before they became unbearably stinky all the time. Handprint and footprint art becomes more of a decoration. It becomes a piece of your child’s past. Here’s how we made our Halloween Footprint Ghosts. 1. 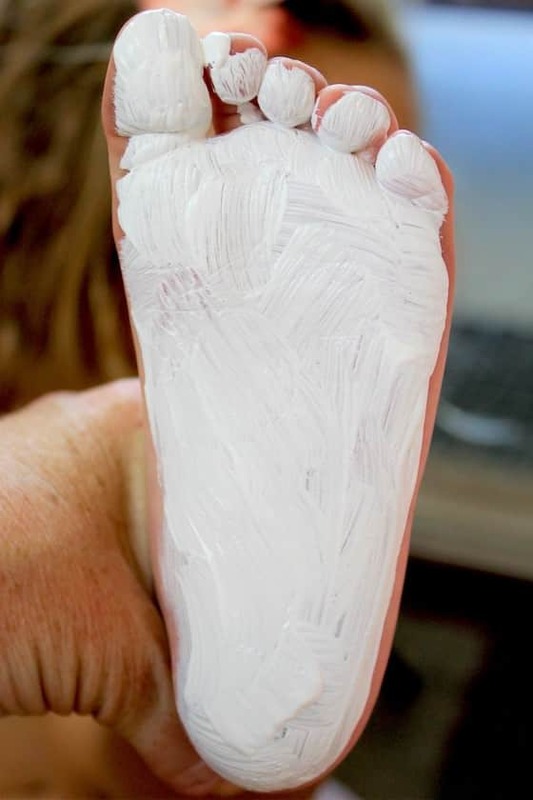 While your child sits, paint the bottom of his or her foot with white washable paint. 2. 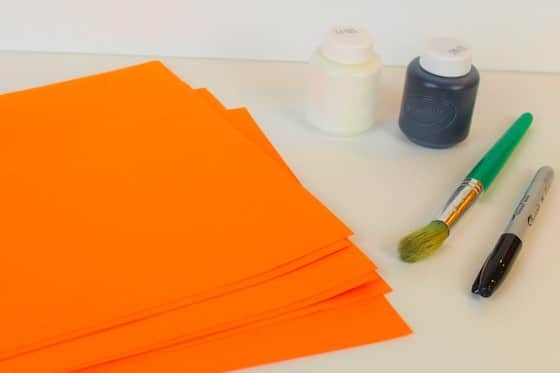 Put the orange paper on the floor and help your child stand and balance on their non-painted foot. 3. Place your child’s painted foot on the construction paper and have them press down firmly. Rub each toe to make sure the paint transfers. 4. Lift your child up and carry them to the sink to wash off their foot, or use wipes to get the paint off. 5. 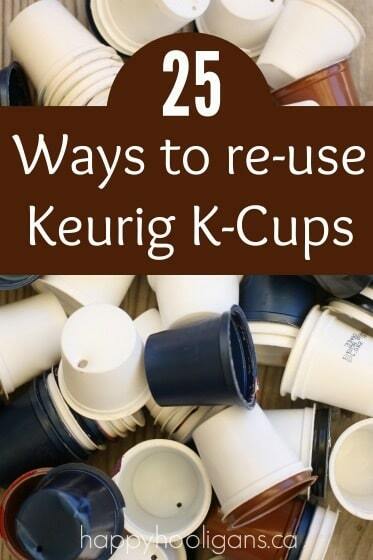 Repeat the steps with each of your children. 6. If your child is a little older and has raised arches already in their feet (and therefore a hollow in their ghost’s body), you can fill it in with white paint or leave it as is. 7. When the white paint has dried, dip the end of the paintbrush in the black paint and dot two eyes on the heel of the ghost print. 9. Date their footprint ghosts and write their names next to their prints so you can remember this moment, and the smallness of their feet on future Halloweens. 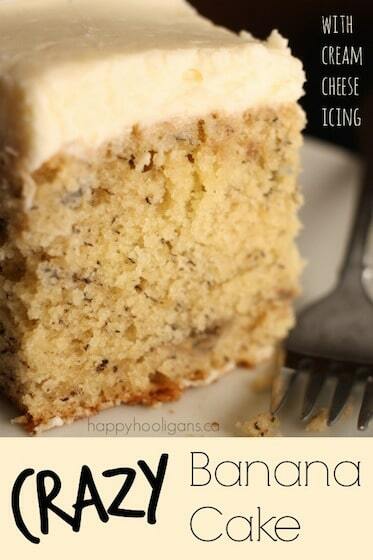 I usually make several copies of these ghost footprints and give them to grandparents to hang in their kitchens. Here’s to another Happy Halloween and a trick or treat season that results in full bags of candy.